After peaking at 27 percent of all major leaguers in 1975, African Americans now make up less than one-tenth--a decline unimaginable in other men's pro sports. The number of Latin Americans, by contrast, has exploded to over one-quarter of all major leaguers and roughly half of those playing in the minors. Award-winning historian Rob Ruck not only explains the catalyst for this sea change; he also breaks down the consequences that cut across society. Integration cost black and Caribbean societies control over their own sporting lives, changing the meaning of the sport, but not always for the better. While it channeled black and Latino athletes into major league baseball, integration did little for the communities they left behind. 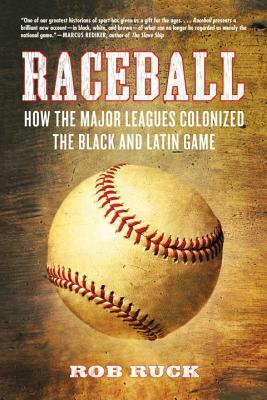 By looking at this history from the vantage point of black America and the Caribbean, a more complex story comes into focus, one largely missing from traditional narratives of baseball's history. Raceball unveils a fresh and stunning truth: baseball has never been stronger as a business, never weaker as a game. Rob Ruck teaches at the University of Pittsburgh. Author of Sandlot Seasons: Sport in Black Pittsburgh and The Tropic of Baseball: Baseball in the Dominican Republic, he made the Emmy Award–winning documentary Kings on the Hill: Baseball’s Forgotten Men. He lives in Pittsburgh with his wife, Maggie Patterson, his coauthor for Rooney: A Sporting Life.